The Pirates are finished navigating the rough seas of the Potomac Valley docking in Paw Paw to send Moorefield off the plank after a 72-61 victory in the Class A Region II Section 2 semifinal on Thursday. Paw Paw (17-7) has seen its share of futility in recent years like the Yellow Jackets (4-20) have experienced this season, but the playoffs are a time to erase all doubt with a clean slate. “That’s a tough year. That’s a tough season. 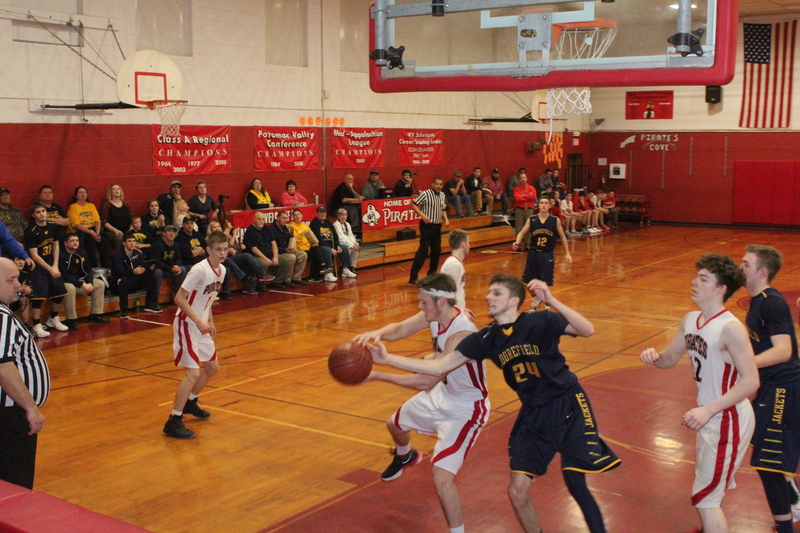 Our kids showed character and never gave up,” Moorefield Coach Scott Stutler commented. These two squads have a storied playoff history meeting in three region championship games in 1999 (Moorefield), 2000 (Paw Paw) and 2002 (Paw Paw) and section playoffs won by Moorefield in 2006, 2009-10. 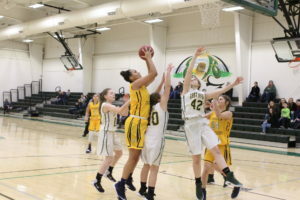 However, since 2006 the series has belonged to the Yellow Jackets stinging Paw Paw 16 straight times before the Pirates righted the ship this season with a 65-60 regular season win. 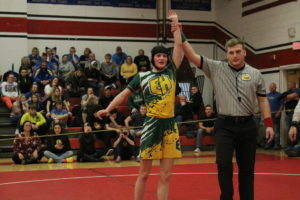 “It’s unimaginable, it’s a good feeling,” Paw Paw Coach Chris Poniris remarked. Paw Paw advances to the Region II Section 2 championship against Tucker County (12-10) this Saturday as the Mountain Lions edged Pendleton County (12-10) 54-52 in the other semifinal. Paw Paw’s Landon Ridgeway knocked down a couple of jumpers and Dylan Moreland hit a 3-pointer early in the first period, while Moorefield’s Garett Haggerty and Brent Moran notched a couple of shots creating a 7-4 score just three minutes into the semifinal. 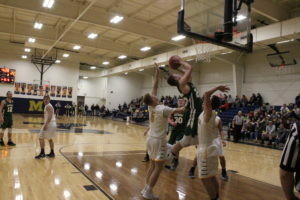 Haggerty scored a game-high 30 points in the final game of his Moorefield career, while Ridgeway guided the Pirates to the victory with a 28-point performance. A free throw by Paw Paw’s Christian Braithwaite made it 8-4 at the 4:43 mark and in a dozen seconds Haggerty nailed a jumper on the ensuing possession. The Pirates responded with a layup by Braithwaite and a defensive rebound leading to a score by Matthew Kidwell to create a 12-6 edge with 3:42 left in the opening frame. Both teams missed a pair of baskets, then a save by Paw Paw’s Coby Ridgeway was intercepted by Haggerty, who went in for layup at 2:45, 12-8.